Silvopasture is the most commonly practiced form of agroforestry today, covering 1.1 billion acres worldwide. 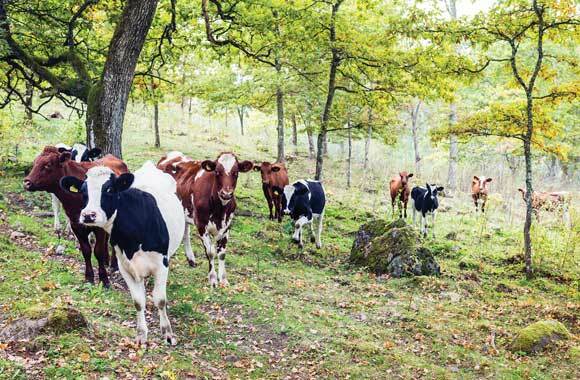 The theory is simple: Combine trees or woody shrubs and pasture grasses to foster greater livestock yields. What happens if you intensify the process? Add more animals, plant different types of trees, and rotate the herd more quickly? It seems counterintuitive that it could have a beneficial effect on land and climate, but it does. Developed by ranchers, intensive silvopasture is practiced today on more than 500,000 acres in Australia, Colombia, and Mexico. Most systems use a quickly growing, edible, leguminous woody shrub: Leucaena leucocephala. Planted 4,000 per acre, it is intercropped with grasses and native trees. Trees keep the wind in check and improve water retention, which causes increases in biomass. 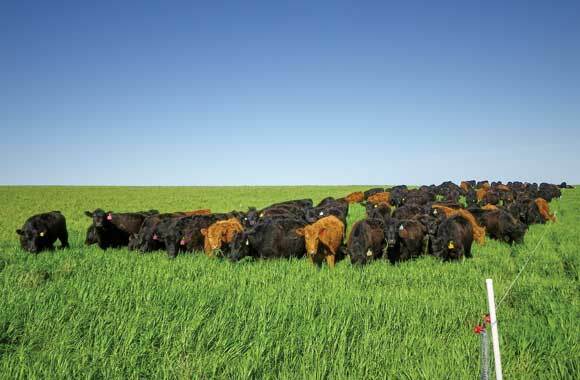 Livestock move through rapid rotational grazing. Species biodiversity doubles, stocking rates nearly triple, and animals gain more weight. Sound too good to be true? In a five-year study of intensive silvopasture in which trees were incorporated with grasses and Leucaena leucocephala, the rate of carbon sequestration was roughly three tons per acre, a high rate for any land use. Silvopasture…1.1 billion acres worldwide: Nair, P. K. R. “Climate Change Mitigation: A Low-Hanging Fruit of Agroforestry.” In Agroforestry—The Future of Global Land Use, edited by P. K. Ramachandran Nair and Dennis Garrity, 31–67. Springer Netherlands, 2012.
carbon [sequestered] per acre: Toensmeier, Eric. The Carbon Farming Solution. White River Junction, VT: Chelsea Green Publishing, 2016.
developed in Australia in the 1970s: Toensmeier, Solution. Species biodiversity; Stocking rates; Meat production: Toensmeier, Solution; Cuartas Cardona, César A., Juan F. Naranjo Ramírez, Ariel M. Tarazona Morales, Enrique Murgueitio Restrepo, Julián D. Chará Orozco, Juan Ku Vera, Francisco J. Solorio Sánchez, Martha X. Flores Estrada, Baldomero Solorio Sánchez, and Rolando Barahona Rosales. “Contribution of Intensive Silvopastoral Systems to Animal Performance and to Adaptation and Mitigation of Climate Change.” Revista Colombiana de Ciencias Pecuarias 27, no. 2 (2014): 76-94.
intensive silvopasture…five hundred thousand acres: Toensmeier, Solution. Silvopasture is a common form of agroforestry, practiced today on over 350 million acres worldwide. In a five-year study of intensive silvopasture […] the rate of carbon sequestration was roughly three tons per acre, a high rate for any land use. Asparagopsis taxiformis, a species of seaweed, shows promise for reducing methane emissions from livestock—currently 6 to 7 percent of annual greenhouse gas emissions. Perennial crops sequester carbon because they leave the soil intact. Researchers are pursuing grain, cereal, and oilseed plants that are perennial food providers.